Some excerpts from our interview with author Matthew Thomas, which initially appeared in July’s State of the Thing. 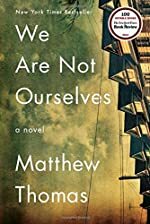 Matthew Thomas‘s debut novel, We Are Not Ourselves, has been a decade in the making, and is set for release—at last—August 19th, 2014. The novel chronicles the life and stories of the Leary family, Irish-American immigrants making their way in New York City. Matthew—born in the Bronx and raised in Queens—has spent the bulk of that decade as an English teacher at Xavier High School in New York City. He holds a B.A. from the University of Chicago, and studied with Alice McDermott at Johns Hopkins University. He and his wife currently live in New Jersey, with their twins. We’ve got 25 copies of We Are Not Ourselves available through Early Reviewers this month. Go here to request one! LibraryThing staffer KJ Gormley caught up with Matthew to discuss We Are Not Ourselves. I could frame your book as everything from “immigrant story” to “big American Dream novel”: In your own words, can you briefly sum up what you think We Are Not Ourselves is about? It’s the story of Eileen Tumulty growing up in post-World War II Queens as the only daughter of Irish immigrants and deciding from an early age that she wants a better life than the one she knows. The book chronicles her journey toward that life and the obstacles she encounters on the way, especially in her marriage to her beloved husband Ed Leary. The second half is the story of how Eileen and Ed handle adversity together. I tried, through telling the story of this one family, to tell some of the story of the middle class in America—their hopes and fears, dreams and disappointments, and quiet achievements over the course of the twentieth century. I wanted to explore the enduring appeal of the American Dream and examine its viability in an environment that is squeezing out the middle class. In the end, I wanted to see what residual deposits might be left in the spirit when a person achieves that elusive dream at any cost. The novel is told through the interchanging points of view of Eileen Leary and her son, Connell. Why did you choose these view-points and not that of Ed Leary, the husband and father in the family at the heart of the book? I wanted the reader to feel palpably the absence of Ed’s point of view, and I hoped to provoke the reader to thought by leaving it out. In omitting such a focal character’s point of view, I wanted to capture some of the essence of Ed’s own isolating experience of dealing with the calamity that befalls him. There is a sense in which those on the other side of Alzheimer’s, even the closest of family members, find the experience of the sufferer inscrutable, almost ineffable. And from a dramatic perspective, I was interested in telling the story of how each of the people closest to Ed, including extended family and friends, responds to Ed’s disease in his or her own way. Ed became a fulcrum around which all the characters revolved, and his illness became a backdrop for a series of character studies and explorations into human nature. I tried to take my cues from the characters themselves in presenting a range of possible reactions that might capture the manifold ways people handle bad news. The Leary family is composed of first-generation Irish-Americans and their son. Why did you choose this particular immigrant subculture rather than any other? The Irish-American community is the one from which I emerged, so it was the one I could write about with the most immediate authority. I tried to capture some of the truth of the lived experience of a people in a particular place and time—a tribe, a dominant culture, a subculture, whatever you choose to call it—as best as I understood them. But one thing I found was that focusing on one culture offers the writer a prism through which to view many cultures. Even within this one culture, Irish-Americans in the New York area, there are countless subcultures. The Irish who live in Rockaway are not the same as those who live in Long Beach, or on Staten Island, or in the Woodlawn section of the Bronx, or in Yonkers, or in Bronxville. And yet they share so many commonalities that they can reasonably be spoken of in the aggregate. I’m interested in the overlaps that lend universality to experiences, because there is something hopeful in thinking of universalities, and I’m also interested in the textures that make experiences distinct. Jackson Heights was a great backdrop for exploring both, as it gathers in one place people from every corner of the globe. On the other hand, I had no particular ambition to write an Irish-American novel, but was writing a novel, period, which happened to focus on Irish-American protagonists. I was thrilled to hear from a Greek reader that he’d seen his father in Big Mike, and from a Montenegran one that he’d seen his grandfather. This book is refreshing in its frank discussions of money, at least in the character’s heads. Why do you think it was important to leave calculations of pensions and home equity loans in your novel? I think it makes a book more realistic for there to be discussions of money in it—budgets, plans. This is the stuff of real life. It’s what the overwhelming majority of people have to deal with on a daily basis. Not to write about the routine details of people’s sometimes difficult financial circumstances is to avoid writing about a crucial aspect of everyday contemporary experience. And money is the last taboo in American life, so frank discussions of money, as long as they don’t delve into the most obscure minutiae and leave the reader behind, can create a frisson in the reader perhaps even more potent than the one created when a writer trains the lens on a character’s bedroom and intimate life. What was your favorite scene to write? My favorite scene to write was Eileen saying goodbye to Sergei, the live-in nurse she has gotten close to over the course of the book. It was a scene that unfolded for me in a relatively automatic way after all the work I’d put into constructing that arc of the story, and I just tried to race to get it down as it presented itself to me. One of the underlying plots of Connell’s relationship to his father, Ed, is through their shared love of baseball. Why do you think baseball keeps turning up in books that are at some level about the American Dream? I think part of why baseball has long been fodder for American fiction writers, apart from the novelistic feel of a season or the short story feel of an individual game, is that it does indeed bring people together in a common conversation. For years, baseball was a point of entry into American culture for immigrants who found they could share a language with established Americans in the joys and tribulations of fandom. And it was a primer for many males in the performance of the rituals of masculinity, beginning with stickball or little league or the catch with dad, and continuing, the idea went, into one’s relationship with one’s own child. Baseball fandom became a signifier of one’s willingness to assume certain ratified, prescribed male roles. And affections for teams were tribal, and epic in scope. If a girl’s father was a Yankees fan, then she was a Yankees fan. That bone-deep identification is fertile territory for fiction, because it activates the most basic impulse of storytelling. This is who I am—a Yankees fan. »For more from Matthew, read our full interview here. Can you see me sitting here waving my arm like a kid in school who KNOWS the answer and wants the teacher to notice?? PICK ME! PICK ME! I would love to win a copy of this book — I’ve been reading about it quite a bit and am dying to read it!